Choose from 20 different themes! 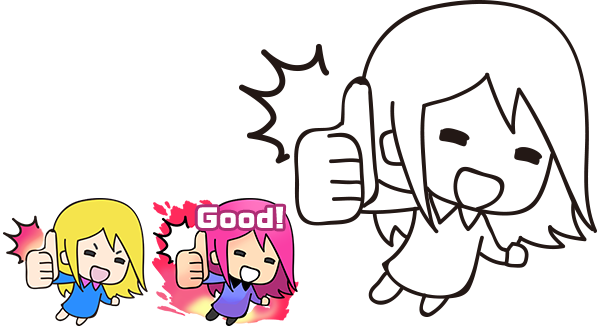 Stickers need to be easy to use in messages and be able to convey emotions. In order to make your stickers easier for users to see they should be as close to the maximum size allowed as possible. People like you can join too! We have line art prepared for people to color in. Words and designs can be added. you want to color to download it. You can also print out stickers and join. Can I just submit one sticker? Can I select more than one theme? Can I submit more than one sticker for one theme? Can I submit a black and white sticker? Yes. You can submit black and white or color stickers. I don't want to design a character. Can I submit a symbol instead? 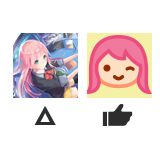 Yes you can submit symbols ex. a heart or sparkles. Can I use MediBang's characters? Sure! Ex. 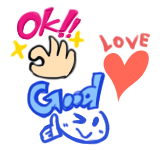 You can do 'Love' using Medi Chan or 'Moved' using Medi Squid. Characters owned by a third party can be used with permission from the owner. using the LINE Stickers (1x) document size in MediBang Paint will create a file this size. Sticker character name, and when the sticker is meant to be used and things like that. After creating a MediBang account and logging in click the 'Enter Contest' button on this page to go to the art submission page. On the art submission page click the 'Sticker Contest' button to upload your stickers and enter the contest. For people not submitting digitally first download and print the sticker form, write a username and email adress, comment, draw your submission, and then mail it in. ※We will not be able to display every entry. ※Entries submitted by mail will not be returned. Once the submission period is over the winning submissions will be posted by MediBang!. The contest winners will be contacted by MediBang by email. ※If a winner lives outside of Japan in order to receive their prize they must have a Paypal account or Japanese bank account. ※MediBang will decide when to make an international bank transfer. Due to the exchange rate the prize amount can vary. Winners will contacted directly by MediBang! Entrants who don't want their prize can notify us at that time. By entering this contest entrants agree to the terms and conditions of this contest. Before entering the contest we strongly recommend that you read all of the contest rules.